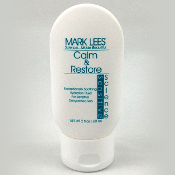 Mark Lees® SENSITIVE SCIENCE® products address the needs of the delicate, reactive skin. Special formulation techniques, addition of soothing agents, and avoidance of known irritating ingredients make this highly-tested line ideal for sensitive-dehydrated, or reactive skin. Clients with rosacea or other redness problems will benefit greatly from this line. All products are dermatologist- and irritancy-tested on humans by an independent consumer testing facility. No formaldehyde-releasing preservatives, no drying alcohols, no fragrance, no color agents, no stripping detergents.